Little Bluebell: How About Green? 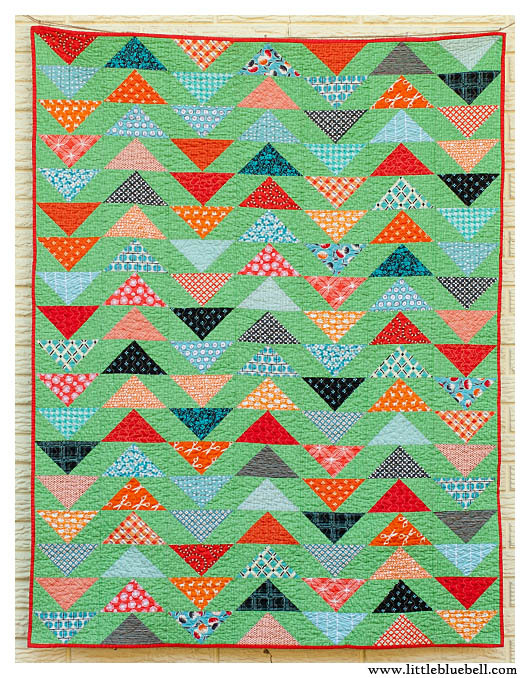 This quilt was made for the joy of playing with fabric and color. I picked up a few of the new prints from Denyse Schmidt and Juliana Horner (yes, Anna Maria Horner's daughter) from Joann's and I couldn't wait to use them. I was getting an aqua and orange vibe and I pulled additional prints from my stash in those two colors. I selected several prints from Denyse's older lines. I love the fresh retro vibe they have. There are also some deer, scissors and typewriter keys mixed in for good measure. To add depth, I included some deeper tones of tomato, teal, charcoal and black. I don't know how exactly, but I decided I wanted to make some flying geese. 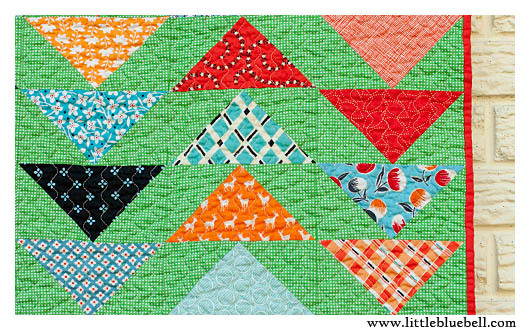 Little rows of triangles marching up and down in a random, scrappy assortment. The pieces were cut and I was deciding between white and grey for my background fabric, then my son walked by. He was curious what all the piles of fabric were about and I explained that I was trying to choose the one color that made all of the other colors bright and happy. He went over to my fabric shelves and picked out this fabulous green polka dot print. "How about green?" he says. How about green?! Yes! Brilliant!! I think I should consult him more often. The combination of fabric was so busy, that I wanted a simple quilting pattern to add texture only. This is the wavy stitch on my machine. It's #19 on my Janome and I adjust it as wide and long as it will go. The machine does all the work and it looks and feels great when it's done. The blocks are 3"x6" each and the finished quilt measures 42"x54"
Truly awesome! Kids will always amaze and you can never go wrong with flying geese. 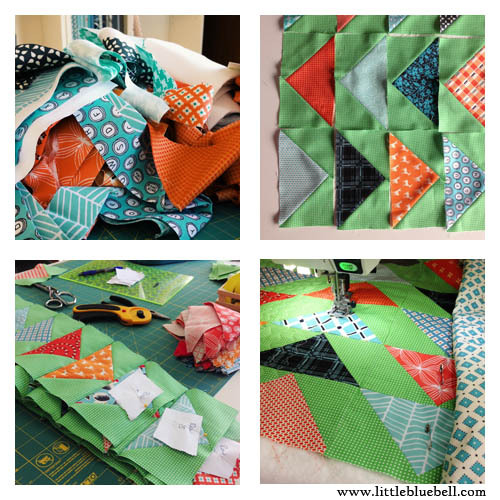 The green really makes the quilt! Beautiful! Your son has a good eye--the green is wonderful! Great quilt. Love the green background. Is he interested in sewing? Green was the perfect choice. I wouldn't have thought of it. Good for him! what a gorgeous quilt! The green is amazing. I've had that green on the brain for a couple of months now, slowly simmering. I found a cotton couture solid (pastille) in that color, but what is that fantastic polka dot!!? I love your happy quilt! Great quilt and love e colors....great green! LOVE it!! The green looks awesome and really makes the oranges pop. A gorgeous quilt! It's fantastic, Adrienne! I'll admit I was a bit skeptical about the green when I saw it in progress, but it really works! I love that your son helped pick it. Those kids are brilliant, aren't they? Yes...I think you should consult your son, too! I love green and it just makes the geese pop :) Give him an extra hug from me. So great - you must be able to do flying geese in your sleep to pull so many off in such a short amount of time, impressive. Love to pop of the binding too. I would never have picked green but it looks so amazing! Your son has talent! My 8yr old son is my favorite to take fabric shopping with me. I can give him a description of tones & elements I want to find in a fabric, he takes off and returns from who-knows-where with THE perfect fabric while I'm still stuck in a color section having no luck - every.single.time.